Hope you guys all had an amazing Labor Day weekend! I had a fabulous break at a church retreat way out in the mountains (did you see me basically be Katniss Everdeen?) but now I'm back and ready to tackle Fall. Since we are now in our last month of Summer I wanted to squeeze out some last summery favorites for August before the weather cools down and we get too cozy in our flannels and jewel-tones. 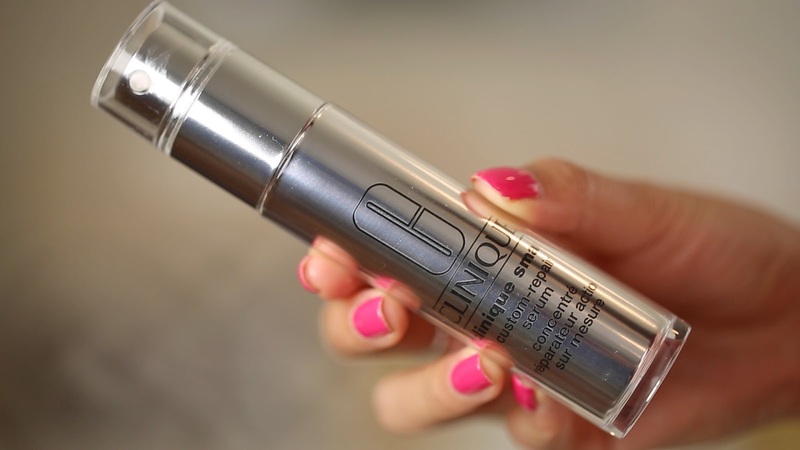 So this month one product I want to talk about in particular is the Clinique Smart Custom-Repair Serum. I initially had low expectations of it just because I always assume any product that says it does multiple things will not do all the things quite as well as something meant to do one thing. Thankfully, this serum actually really wowed me on the dark spot-reducing front, which is ironic because I also have the Clinique Dark Spot Corrector. Between the two I thought well hey, why not try out the one that says it also improves skin radiance and reduces signs of aging? As I creep closer to my 30's I've been noticing a few extra fine lines so I need to up my skincare game! I think I need to use it a few more months to see if it actually reduces wrinkles and improves texture, but for now I can say that the time it took for dark spots to fade decreased dramatically and I have zero pore-clogging or acne-causing problems whatsoever. I am very satisfied and will definitely continue using it morning and night. Readers, is there a particular serum you love? What are your main skin concerns right now? Let me know in the comments! Freckle and acne are my two major concern. You always have many great things to share and it's always new..
Hi Jen! I recently started transitioning my skincare products to mostly Korean brands. So far, I am a fan of Be The Skin serums, but am also looking for a good "all-in-one" kind of serum so maybe I'll check out the Clinique one too. My main concerns are always enlarged pores, general texture, and some redness. Hi babe, what foundation would you recommend for people with enlarge pores? Hi Jen, I've tried the Darkness lash glue and I liked it a lot, my only problem is that it's almost too strong. How do you take off your lashes at the end of the day? Thank you, and love your videos!